Please do not post in this thread yet. Still under construction. Please subscribe to this thread if you are interested. The Story of Southgate, Montana will scroll upwards. If you want to start at the beginning, refresh the page. People begin to get really sick. The entire town of Southgate, Montana is quarantined by the Federal Government. The entire town of Southgate, Montana must be sterilized. But not all of the citizens of Southgate were affected. Something is preventing them from leaving. And they have been known to operate with the same reckless disregard for human life as Umbrella. but it isn't immediately clear how they are involved. Before they are all consumed by the zombie horde. 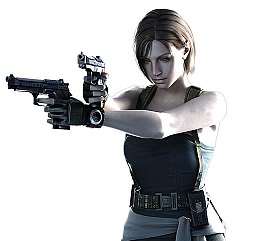 This will be another Resident Evil-themed "Battle Royale"-style game in the same vein as my Dark Falls game. I would like to get 50 players. Please. Or otherwise failed to participate in the past. As such, space will be limited, and entry into the game not guaranteed. After I have achieved the necessary numbers, players may serve as reservists. That's right, this game is an INVITATIONAL game. Let me tell you why, and how it works. I will not open "sign-ups" for this game until an announced date. Sign-ups will remain open until they are full, first come, first served. The list of players will primarily be populated this way. When I reach 50 players on the VIP list, I will send each VIP a message letting them know when the sign-up sheet will be open. Then, on that date, I will open sign-ups, for a limited time. Any VIP who agreed to reserve a space is guaranteed entry into the game. The slot will be granted to anyone who is enthusiastic about playing the game and chose to sign up. That way, if you are interested but were not personally invited, you still have a chance to join. You are also allowed to tell me that you wish to be invited. PM me. This is necessary because last game, several spots went vacant. If you wish to be formally invited, send me a PM. Askthepizzaguy is the primary host and architect of the game. GeneralHankerchief is the backup co-host. That way this game will be completed even if Askthepizzaguy is mortal. Southgate, Montana. A city which is located near Dark Falls, Montana. The events of this game take place months after the events of Dark Falls. Still putting the finishing touches on the design. Put simply, there is a cycle of turns. Interactive round- you've arrived at your location. Hide, search, attack, ambush, barricade yourself in a building, etc. Then, the cycle starts over again. Your mission as a Survivor is to complete mission objectives and then leave Southgate alive. South Gate- Bottom of map, slightly on right, 2 tiles. Parks and riverfront district- Along the banks of the river. Southgate elementary- 2x4, Southwest portion of map, in red. Maximum security prison- Southwest of Hosptial, across the river. 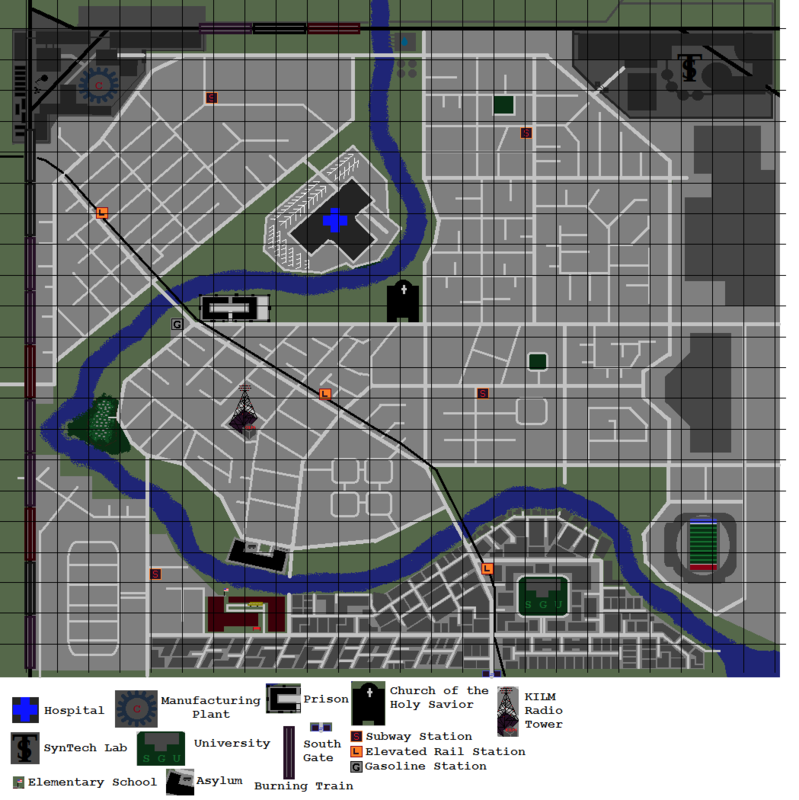 Map is under construction. This is what I have so far. 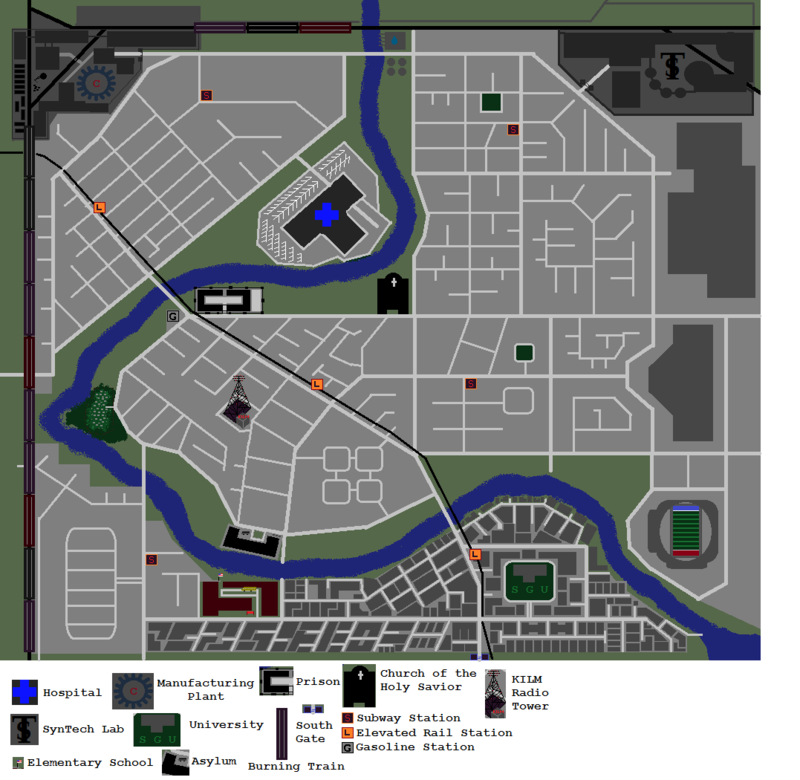 Much more about the game rules, game mechanics, and the finalized version of the map will be posted later. This thread serves as the advertisement for the game and also as the future sign-up sheet for both VIP's and any other players. Thread stays closed for now. Last edited by Askthepizzaguy; 09-28-2013 at 07:12. Last edited by Askthepizzaguy; 10-31-2013 at 16:19. Follow this link to see the design in progress and participate in the pre-game discussion. THIS GAME IS A SERIOUS COMMITMENT AND IT CAN LAST FOR LITERALLY THREE TO SIX MONTHS. IF YOU FORESEE DIFFICULTIES COMMITTING, PLEASE DO NOT REQUEST AN INVITE! Last edited by Askthepizzaguy; 09-25-2013 at 19:00. Last edited by Askthepizzaguy; 09-28-2013 at 06:42. You cannot modify your Luck Stat. You're not done until every last innocent man and woman is safely out of Southgate. One of the best ways to ensure that happens is to shoot every zombie you see, destroy any hostile creatures you find, slay El Gigante, eradicate SynTech mercenaries, Umbrella mercenaries, and any psychopaths, serial killers, and Agents you find. However, if this proves to be too difficult, just lead the survivors to safety and protect them with your life. Your training will come in handy. The more people you save, the better your score. If you personally survive, all the better. The more enemy agents and creatures destroyed, the better your score. Get as many survivors out alive as possible. Unlock as many buildings and landmarks as possible. You can DEFEND anyone who is in the same tile as you are. Anyone who is targeting the people you are Defending will target you instead, for as long as you are alive and part of the battle, while the others fall back out of harm's way. This ability is NOT AUTOMATIC. You must tell me, in your orders to me every round, specifically which people you choose to defend. I need the players' names, any and all you wish to defend, in a list, every single round. Anyone you do not trust, you can leave off the list. 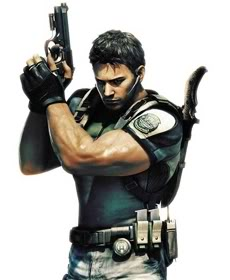 You are here to rescue people with the help of Leon S. Kennedy. You can identify him on sight. Please remember not to contact anyone during the game unless they are standing next to you on the map, adjacent to you on the map, or you both have a two-way communications device. You're not telepathic, and this hindrance to your efforts is part of the balance and fairness of the game. Please keep it in mind. Technically, all the town survivors in the game are your allies, but some of them are hostile to other townsfolk. Average 4 per stat, MINIMUM 7 for Search. You can only add points to your Search stat, you cannot take points from it. Your mission is to get yourself and your fellow town survivors out of Southgate alive. The more of you are alive and successfully escape at end of game, the better you all score. Get yourself and as many other town survivors out of Southgate as possible. Unlock as many key buildings and landmarks as possible. Find as many key items and rare items as possible. You have no special abilities, however, your high search makes you a decent survivalist, and an especially important member of your team. Trading items that you find and don't need away to your teammates is vital for your team's success! You don't know anyone else in town personally.